There's an ! on our Team! The team that you have is the team that you deserve is a well-known penned phrase. I for one, as a Director of Intro Recruitment, have never been prouder of a team of consultants and would not swap my group for any other team of recruiters in the whole UK. Our placement rates, attention to detail and candidate satisfaction win the gold medal every time with our clients and candidates alike. 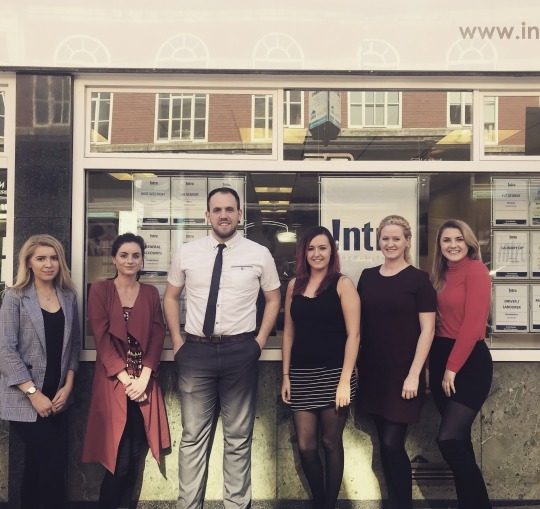 At Intro Recruitment we have developed both a team and strategy that exceed customer and client satisfaction time after time. Young in years but skilled way beyond those years, the group of individuals that we have assembled has contributed to one of the most successful months in the 36 year history of this great organisation. I congratulate each one of my fantastic team on a superb April as we go from strength to strength in Recruitment Brilliance. Zoe Makinson – As longest serving consultant, Zoe has developed into a trusted advisor that our key clients turn to as their first choice of Recruiter to solve their vacancy problems. Jessica Langley – Gold medal winning Recruiter whom 6 months ago was serving our clients and candidates (and one or two of our consultants) in a bar. Now there is no better consultant to serve your recruitment enquiry. Perhaps the bar should have been called Recruitment Bar None? Laura May – Laura heads up our specialised Commercial Division. If hard work and dedication to the cause were an Olympic event, Laura’s caring nature would win her GOLD every time. Roxanne Gilman – The missing jigsaw piece is what I should call Roxanne. She leads our Engineering Division and with her specialist knowledge, has been the missing team member that I have sought for years. Roxanne has not been with Intro for very long, however she is already making waves within the industry. Our Engineering division is going from strength to strength and there is no better person to work your Engineering roles than Roxanne. These amazing 3 ladies look after us and provide a caring support service, allowing our consultants to flourish in the world of job filling. Me – I have been doing this job for over 20 years, I have witnessed recruitment teams come and go. I can honestly say that if you are looking to recruit or seeking a new position there is no better place to look than for the !… An Introduction to Intro Recruitment is just the beginning.